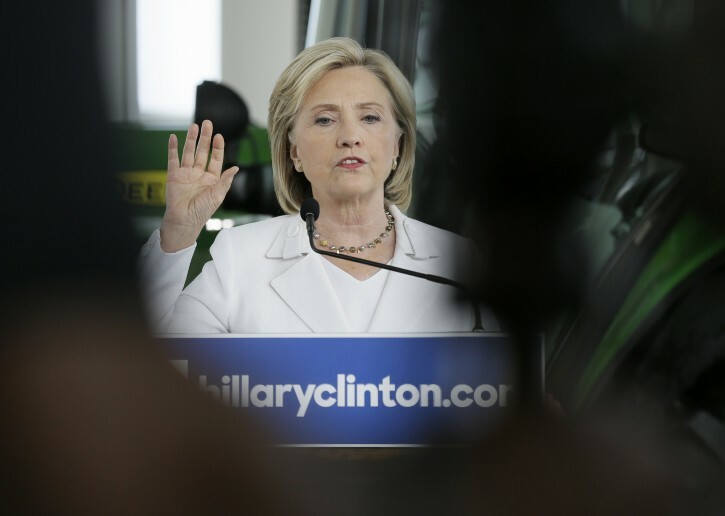 Ankeny, IA - Hillary Rodham Clinton said Wednesday she was stricken by the news of two journalists shot to death on live television and promised to pursue policies that could cut down on gun violence if she is elected president. Clinton also extended condolences to the victims’ families and co-workers. She spoke a few hours after reporter Alison Parker and cameraman Adam Ward of WDBJ in Roanoke, Va., were gunned down during a live television interview by an apparently disgruntled former co-worker, who later killed himself. The journalists were interviewing a local official at an outdoor shopping mall for a tourism story, when, at about 6:45 a.m., morning show viewers saw her suddenly scream and run, crying “Oh my God,” as she fell. Ward fell, too, and the camera he had been holding on his shoulder captured a fleeting image of the suspect holding a handgun. President Barack Obama and some members of Congress have tried several times in recent years to tighten gun control laws in response to mass shootings in Connecticut, Colorado, Washington, D.C., and elsewhere. Gun rights advocates have fought those efforts, saying they would infringe on people’s constitutional rights. She's pledging to fight gun violence? Is she going to stand guard somewhere armed and ready for confrontation? Oh wait I know she's going to propose more legislation to take away guns from law obiding citizens! There's no way to stop a phsyco or a criminal except a bullet! She might be against guns. But she is not against murder. Check out the record of the Clintons while Bill was in office - people died in a variety of mysterious ways. But at least they were not shot. The murders in Benghazi might not have been by guns, but she remains responsible (her own words) for their deaths. But at least, candidate Clinton takes a stand against guns. The mortuaries will still be busy. If not by murder (non-gun), it could be due to the utter neglect of the trashed health care system. But not guns. Does anyone detect intellect or morality here?